India in the early 1930s moving from west to east, consisted of what is now Pakistan, India, Bangladesh, and Burma, which was a province of India until around 1937 (see map). There have been armies in India for centuries before the British arrived, but the Indian Army that my father served in originated from Clive and the armed forces of the East India Company. A bit like a mercenary army it defended the company’s gains and was also at the disposal of the British Crown. In a recording made in 1974 my father talks of the beginnings of Empire and the Indian Army. However, the distinct difference between the British Army in India and the Indian Army was that the officers in the Indian Army were British but the other ranks, or Sepoys, were Indian of all races and religions. “The Khyber Pass is 28 miles long and is, or was in my time, a most exciting and dangerous place. I arrived at Landi-Kotal which is about 20 miles up the Pass. The Pass widens out here, and it is, or was, the main encampment in the Khyber. Here the railway stops." 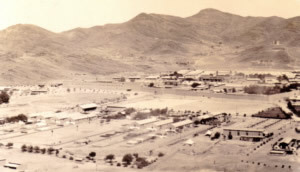 Having disembarked at Karachi on 1 November 1933 he made his way to the Khyber Pass by train. 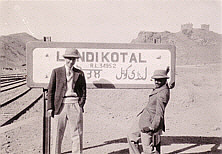 At Landi Kotal station he is met by his friend Jai Majumdar who was at Sandhurst with him and is also joining the British regiment. 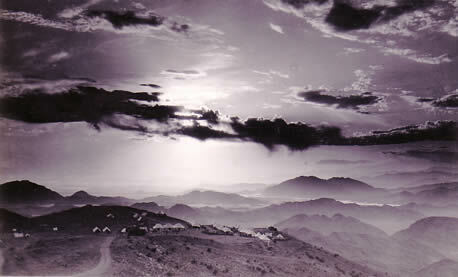 The photograph below is a view of a camp on the Khyber Pass taken at sunset.